No need for additional storage space, this self-storing leaf folds together and can be stowed underneath the table when not in use. Quickly extend your table to seat guests or serve more food or put the leaf away to create a smaller, more intimate dining space in your home. 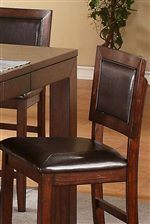 Enjoy a warm and welcoming dining experience with this leg table. The piece features a simple silhouette with clean lines and block legs, which lets the beautiful veneer table top and Mango finish shine through. The Fallbrook Rectangular Leg Table with Butterfly Leaf by Winners Only at Crowley Furniture & Mattress in the Kansas City Area: Liberty and Lee's Summit, MO & Overland Park, KS area. Product availability may vary. Contact us for the most current availability on this product. 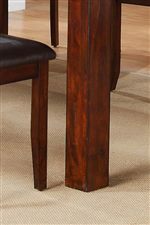 Leaves Includes One 16" Butterfly Leaf that Extends Table Length from 68" to 84"
Crafted of mango veneers and hardwood solids with a stunning Mango finish, Fallbrook is a warm dining collection that suits a variety of styles. The collection features standard and counter height dining options, as well as a chic bench seating option. Tapered and block legs and simple silhouettes highlight clean lines, while chairs, stools, and benches feature comfortable upholstered seats for casual and versatile style. The Fallbrook collection is a great option if you are looking for Transitional furniture in the Kansas City Area: Liberty and Lee's Summit, MO & Overland Park, KS area. Browse other items in the Fallbrook collection from Crowley Furniture & Mattress in the Kansas City Area: Liberty and Lee's Summit, MO & Overland Park, KS area.